Elizabethtown native Nathan Adcock surrendered two hits in two scoreless innings and struck out two batters for the Kansas City Royals. 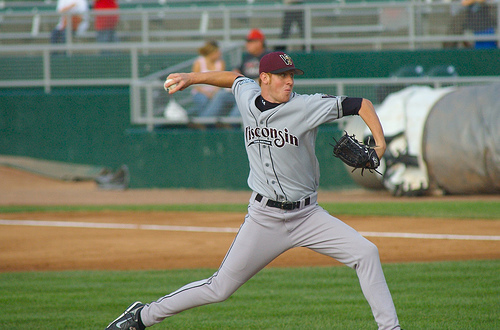 Adcock, a 2010 Rule 5 draft pick, has yet to surrender a run in three spring appearances. PLD alum A. J. Ellis was 2-2 with one run scored and one RBI for the Los Angeles Dodgers. Highland Heights native and former NKU right-handed pitcher Josh Lueke surrendered one hit in two scoreless innings and struck out one batter for the Seattle Mariners. Lexington Catholic alum Ben Revere was 0-2 with one RBI for the Minnesota Twins. In that same game Louisville native Trever Miller recorded a hold after walking one batter and recording two outs in a scoreless appearance. Covington native and former NKU right-handed pitcher Nathan Jones was credited with a blown save after surrendering two runs on three hits in one inning for the Chicago White Sox. Lexington native and former UK outfielder Collin Cowgill was 0-3 in a start for the Arizona Diamondbacks. Baltimore Orioles third baseman Mark Reynolds, who was born in Pikeville, was 1-3 with one double and one strikeout.